Among all insurance products offered throughout the Greater Toronto Area, critical illness insurance misses out possibly more than all other coverage types on receiving its due appreciation – right up until someone needs it. To an extent, it’s an understandable underestimation. For one thing, Toronto’s critical illness insurance packages don’t always come at easily affordable rates – at the very least, not as much so auto, health, travel or life insurance, all of which can be had at negotiated lower prices for those with limited income. Additionally, those products address needs that most adults reasonably expect could likely arise at some point or another to generate great personal emergency expenses, whether a severe car accident, healthcare needs that extend beyond what federally provided coverage will meet, or leaving loved ones with security and peace of mind when we die. And that’s just the short list. Funny thing, though: there’s less than a 1-per-cent chance your home will burn down and an average 4-per-cent chance you’ll be involved in an auto accident. You have roughly a 35-per-cent chance of developing a critical illness after the age of 65 and a 65-70-per-cent chance after the age of 81. As with many products and services, critical illness insurance becomes noticeably more affordable with effective bundling. Administrative costs account for a sizeable share of any insurance policy’s premiums. When you roll your critical illness insurance into a life insurance package with a Critical Illness Advance Payment, you’re facilitating your provider’s paperwork-saving luxury of servicing two products at once. Where applicable, also ask about adding a Return of Premium rider to your critical illness package. This is a bit of a trade-off: you’ll actually pay higher regular premiums in the interim until your rider’s defined span passes – say, 20 to 30 years, depending on your preference given your age. If you last through that period without filing a claim – which, of course, eventually costs the provider money – then the rider entitles you to receive your premiums back in full. Finally, customize your coverage’s scope when possible. Some illnesses may be more preventable or likely to occur than others, based on factors from family history to some afflictions (i.e., stroke) simply being incredibly difficult to reliably prevent. Your provider may actually limit you to a certain number of critical illnesses to cover. Think carefully about which possible conditions are most likely to arise, if any. As we said, family history counts for a great deal, for better or for worse. A prevalent immediate-family history of cancer, heart disease, diabetes and other ailments can cost you. At the same time, consult your physician carefully about what you disclose; there are certain advantages to excluding some covered pre-existing conditions as they create a picture of lower risk, but being less than forthright can come back to bite applicants if investigation into a claim later reveals previously unknown information. In the meantime, view your lowered critical illness insurance cost as a reward for healthy, responsible choices. As with many products, smoking will often double premiums. It’s also to your benefit to apply young, as those in the prime of life aren’t seen as drastic coverage risks. Understand also that the younger you apply and the longer you hold onto a healthy way of life going forward, the more pre-existing conditions you’ll avoid and the lower your starting premiums will be. What you may not understand about how critical illness insurance providers view their customers can hurt you. Make numerous comparisons as you shop around from one provider to the next, but do so alongside a Blue Umbrella representative. We can access hundreds of critical illness and life insurance providers’ profiles in an instant, with the training and experience to size them up at a glance to point out the most overall comprehensive, cost-effective coverage. What’s more, our brokers can work through our network of connections with Canada’s most trusted insurers and potentially broker you a deal ourselves through their agents that many people probably wouldn’t receive on their own. We can also spot areas of expensive redundancy that could already be costing you more than necessary. For example, if you already carry Life, Disability or even Mortgage insurance, it’s entirely possible that you already care critical illness coverage. It’s all the more reason to contact Toronto’s Blue Umbrella Financial Services today. We’re happy to offer you an eye-opening initial consultation absolutely free of charge. 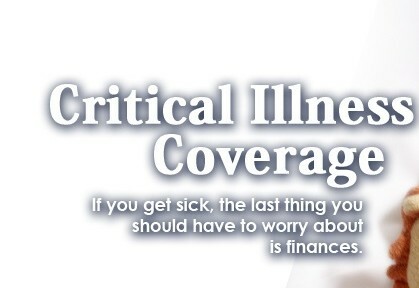 Critical illness won’t wait to strike until you’re financially prepared for it. Tell us about your needs today.